It's a question I seem to get a lot... "Where is Barbados located?" Clearly, you are not alone in wondering. So let's take a closer look at where this island is located. Barbados is interesting because it is a Caribbean island, yet none of its beaches touch the Caribbean sea. This makes it a tad bit harder to give you you a nice clean answer to the question, "where is Barbados?" If you were to ask your GPS system where Barbados was, you would likely need to give it the coordinates. 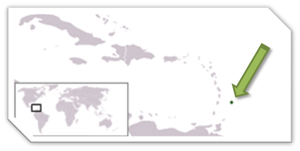 In that case, you could say that Barbados is located at 13°0'N longitude 59°32'W latitude. (These coordinates lead you to the capital city of Bridgetown). This places Barbados firmly in the tropics (between the Tropic of Cancer at 23°26' N latitude and the Tropic of Capricorn at 23°26' (23.4°) S latitude). You can also use the map at right to locate Barbados. The green arrow is pointing to the location of Barbados. You can see that it is farther east than it's Caribbean cousins. Generally speaking, Barbados is the easternmost Caribbean island. Barbados is part of the Lesser Antilles, in the southern part of the Caribbean island chain. It is northeast of Trinidad and Tobago. It's closest neighbors, St. Vincent and the Grenadines, are located to the west. In fact, this very location is the reason that Barbados enjoys those wonderful, cooling trade winds that blow constantly across the island. And now you know the answer to the question, "Where is Barbados located?"